This pattern is available from knittingvirtuoso.com for $6.00. 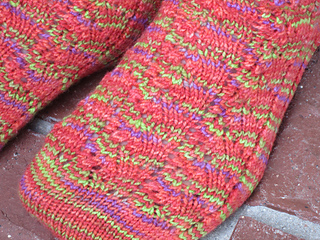 Toe up socks look like a strawberry garden with falling leaf pattern which compliments the hand painted yarn. 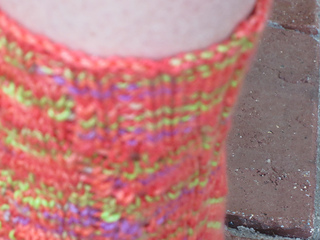 Gusset heel and combination 2x2 rib and lace cuff add comfort and flair. The sole is worked in 2x2 rib for a snug fit. Clever little trick avoids holes at the top of the heel shaping.